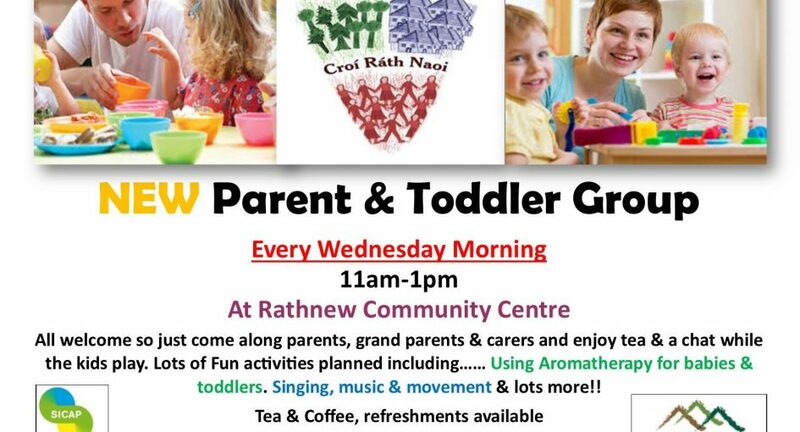 Over the next 10 weeks the newly established Rathnew Parent & Toddler group will host will deliver a series of free Baby & toddler natural therapies workshops delivered by local holistic therapy specialist Antoinette Kavanagh. The workshops will take place every Wednesday morning from 1130am-1230 pm in the Rathnew Community Centre. The coming weeks will explore topics such as, an introduction to how aromatherapy works, the therapeutic actions and the buying and using of essential oils. Baby & toddler Facials- including cleansing, toning all using natural ingredients. Skin care based on skin type and skin Allergies such dermatitis & Eczema will also be looked at. But it does not end at there. Participants will also receive an introduction to holistic massage, reflexology, massage & Indian head massage, relaxation techniques, stress management, meditation, yoga and mindfulness. The free workshops start April 25th and are hosted and funded by Croi Rath Naoi outreach office of County Wicklow Partnership under SICAP 2 programme.